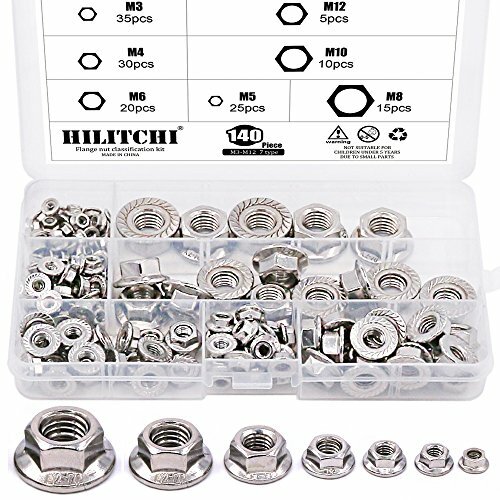 Hilitchi 140 Pcs High Quality 304 Stainless Flange Nuts Assortment Kit Specifications: Nuts Type: Hex Serrated Flange Nut Material: 304 Stainless Steel Color: Silver tone Package Quantity: 140-Piece The Package Contains 7 Sizes Size Included: M3 M4 M5 M6 M8 M10 M12 Features: 304 stainless steel has high strength and hardness ratings and resists corrosion in mild environments Flanged Nut serves to distribute the pressure of the Nut over the part being secured, reducing the chance of damage to the part and making it less likely to loosen as a result of an uneven fastening surface. Because of the serrations they cannot be used with a washer or on surfaces that cannot be scratched. The serrations help in avoiding vibration of nut and increase the holding power of nut. Package Included: - M3 - 35pcs - M4 - 30pcs - M5 - 25pcs - M6 - 20pcs - M8 - 15pcs - M10 - 10pcs - M12 - 5pcs Package Quantity: 140pcs This set is organized by size in a transparent storage case for quick access and protection. Packed in A Rugged Convenient Re-sealable Plastic Storage Case. 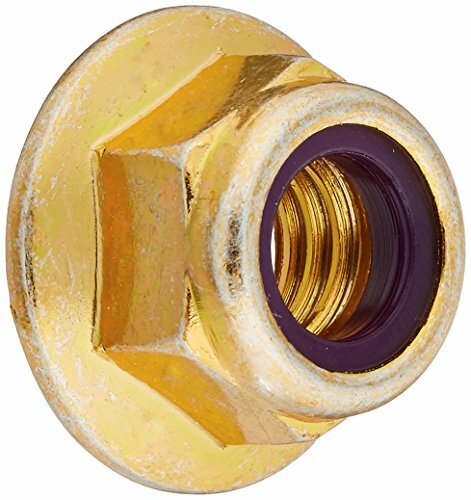 The grade 8 steel flange nut has a self-locking nylon insert design and a zinc yellow-chromate plating. 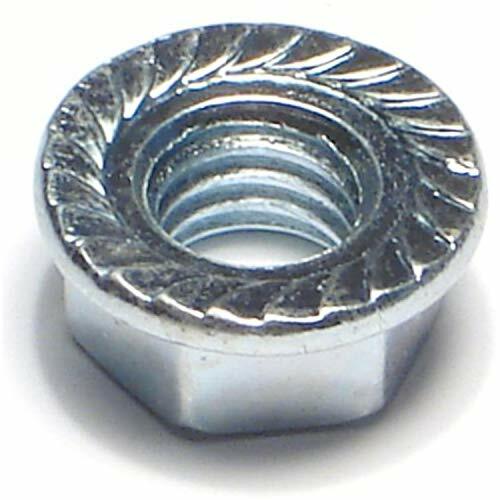 The nut has a flanged base on one end that eliminates the need for a washer when fastening components. It has a self-locking nylon insert to help prevent loosening when the nut is threaded to another component. Grade 8 steel is stronger than grade 5 steel and is often used in applications where strength is the primary concern. The zinc yellow-chromate plating offers good corrosion resistance. 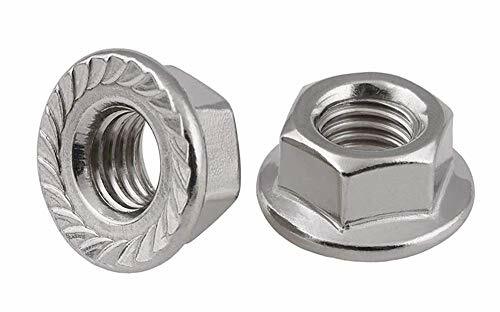 Nuts are internally threaded fasteners that are used with bolts and threaded rods and studs to connect components. 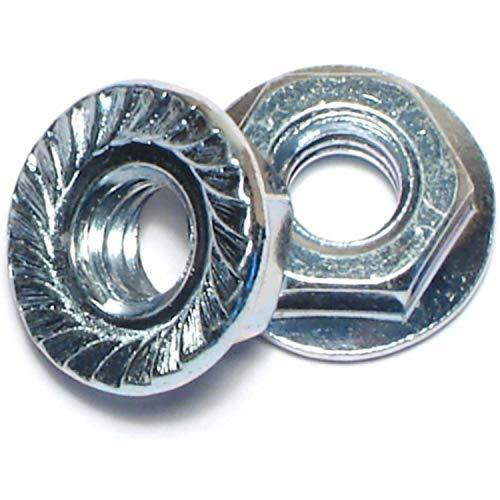 Several different nut styles fit a variety of application and installation requirements. Some styles, such as hex nuts, acorn nuts, flange nuts, and coupling nuts, must be tightened with a tool. Others, such as eye nuts, thumb nuts, and wing nuts, can be tightened by hand. 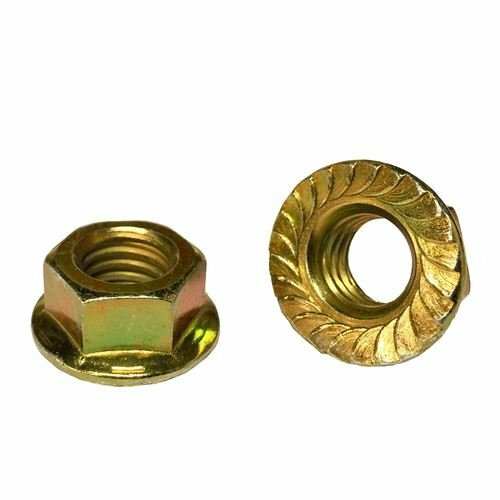 Some nuts have a self-locking mechanism, such as a nylon patch or distorted threads, that makes them suitable for applications with a high amount of vibration. 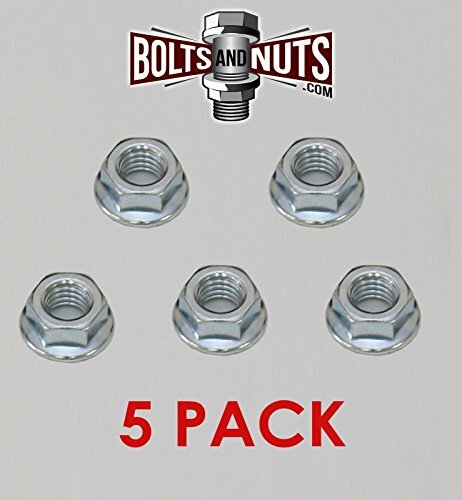 What Are Flanged Nylon Locking Nuts? Flanged Nylon Locking Nuts (also called Nyloc Nuts) are fitted with a polymer insert. The elastic Nylon insert of this component fits tightly against the fastener, and is designed to resist loosening. An integrated flange provides this nut with greater load-bearing capabilities. 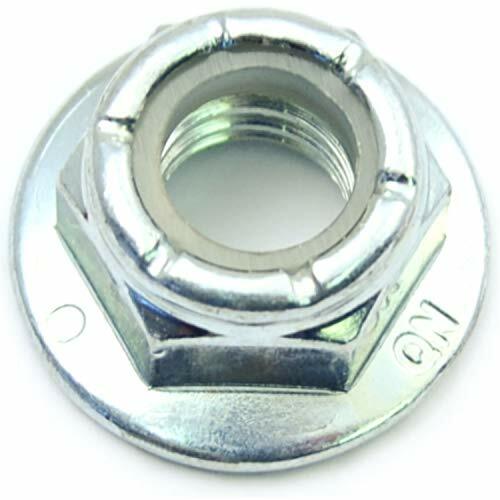 Flanged Nylon Locking Nuts can be manufactured from A2 Stainless Steel. 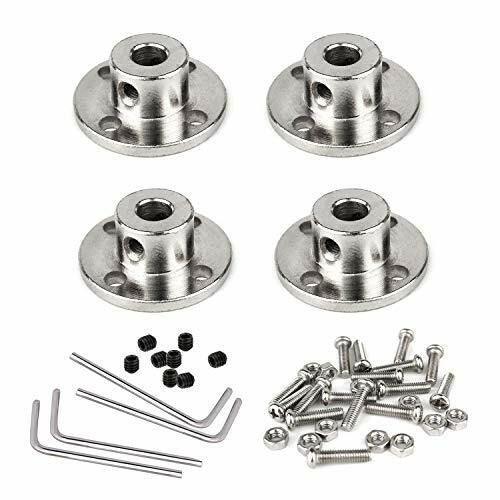 These components are available in thread sizes of between M3 and M12, with flange diameters ranging from 7.8mm up to 26mm. Fullerkreg are the experts in fastener solutions! Product undergoes three levels of quality testing (pre-production, 1st article, pre-shipment). Each completed kit is weight-verified, and samples from each lot are inspected prior to shipping.
. 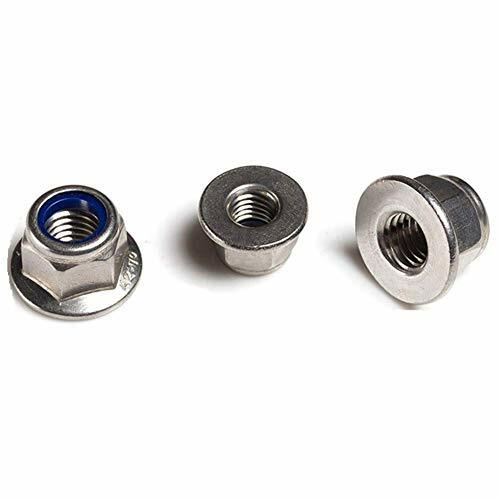 Features: 1mm pitch, 6mm height, 13mm diameter, M6 hexagon flange nuts.
. A flange nut is a nut that has a wide flange at one end that acts as an integrated, non-spinning washer. 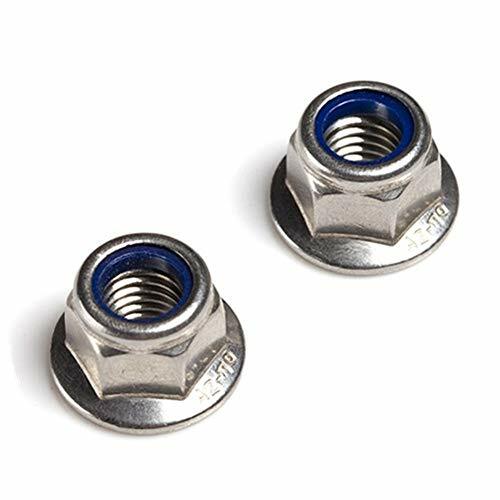 This serves to distribute the pressure of the nut over the part being secured, reducing the chance of damage to the part and making it less likely to loosen as a result of an uneven fastening surface.
. The flange may be serrated to provide a locking action. The serrations are angled such that they keep the nut from rotating in the direction that would loosen the nut. Because of the serrations they cannot be used with a washer or on surfaces that cannot be scratched. The serrations help in avoiding vibration of nut and increase the holding power of nut. Genuine Original Equipment Manufacturer (OEM) parts! 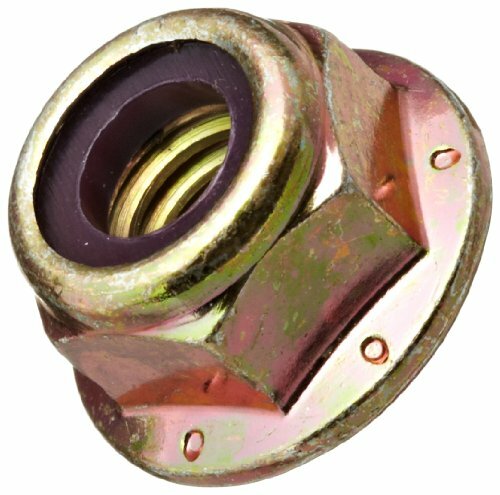 This manufacturer-approved flange nut (part number 532400234) is for lawn tractors. Wear work gloves to protect your hands when installing this part. For Husqvarna, Poulan, Craftsman, Weed Eater, Dixon, Ariens, Rally, & Yard Pro. 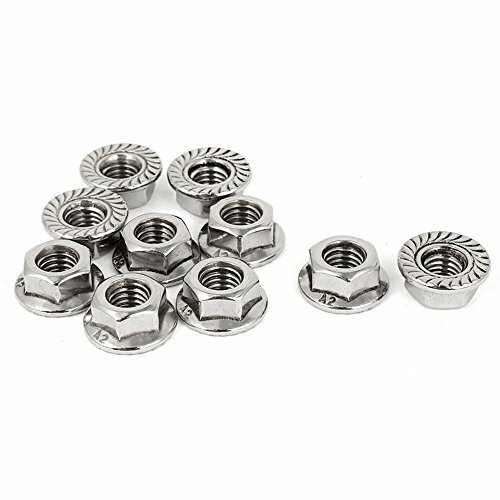 Flange Nuts have flat and serrated designs designed to act as an integrated, non-spinning washer, eliminating the need for a separate washer. Serrated flange nuts are fabricated with a built in serrated washer that resist loosening due to vibration. MewuDecor hardware has the highest quality on the market. Buy with confidence. Money back or exchange guarranteed. Made of high quality stainless steel 18-8 (304) which offers a high level of chemical and corrosion resistance. 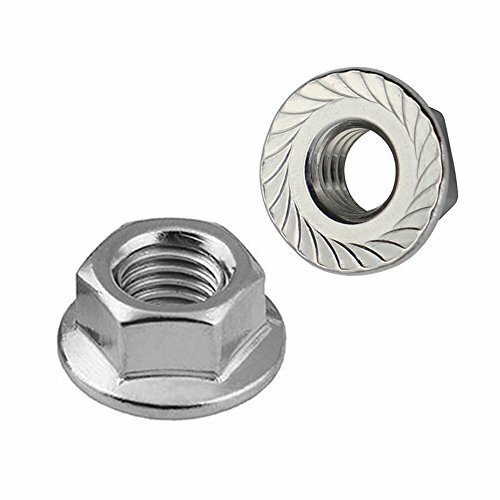 Nut Type: Hex Serrated Flange Nut. Inside Diameter: 1/4 Inch; Thread Size: 20 Threads per Inch. 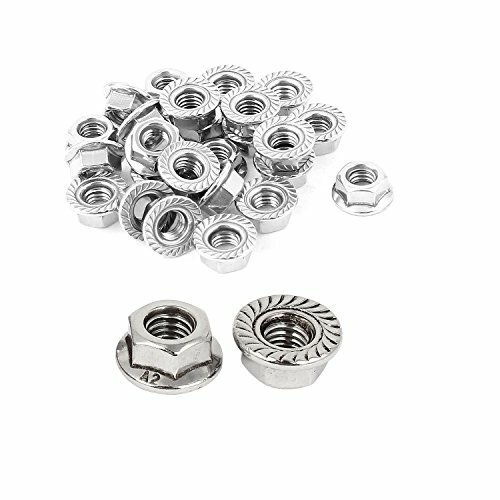 Package Included: 50 x Serrated Flange Hex Lock Nuts 1/4-20. MewuDecor Brand is sold exclusively by MewuDecor Online. When you purchase a MewuDecor Brand product, your satisfaction is guaranteed. 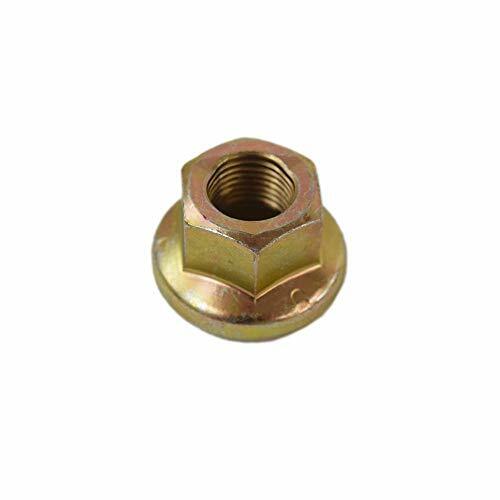 Nut Type: Serrated Flange Hex Lock Nut. Thread Diameter: M6;Thread Pitch: 1mm; Flange Diameter: 12.95mm. Package Included: 50 x Serrated Flange Hex Lock Nuts. MewuDecor Brand is sold exclusively by MewuDecor Online. When you purchase a MewuDecor Brand product, your satisfaction is guaranteed. Money back or exchange guaranteed. Integrated flange nut, and wide flange on one side, and the spinning washer. The dispersion of the nut, the pressure reduces the risk of damage, which would reduce the possibility of loosely fixed makes a flat surface. This provides the flanges serrated locking operation. This is because the saw-tooth angle, the direction of rotation of the nut, and the nut is loosened. The serrated washer, and can be used on the surface of the wound. To prevent this sawtooth oscillation of the nut, increasing the holding force of the nut. 1/4" 5/16" 3/8" 7/16" 1/2" Grade 8 Hex Flange Prevailing Torque Lock Nut Yellow Assortment - 95 Pieces! 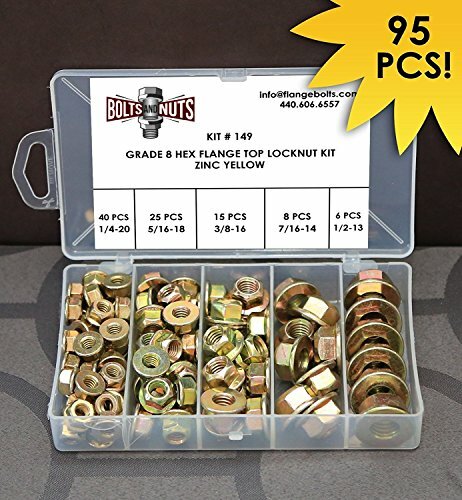 95 Pieces - 1/4" 5/16" 3/8" 7/16" 1/2" Grade 8 Hex Flange Prevailing Torque Lock Nut Yellow Assortment! Made of 45# steel, hardened, surface plated, durable. It is easy to mount other components on the shaft. Flange shaft coupling for connection of model shaft to RC model motor, etc.